A Review of PartyPoker - where the poker fun never stops! PartyPoker Review - The Net's No. 1 Poker Site? PartyPoker was one of the first online poker rooms to really hit it big. It launched way back in 2001, and for many years it battled with PokerStars in a fight to claim the title of the number one poker room on the internet. By the time the U.S. goverment issued its ban on players from the U.S. playing at online poker rooms, PartyPoker was the most popular poker site on the web, but was hit very hard by the U.S. ban. It has since been bought by Bwin Interactive Entertainment, and with a complete and stylish re-branding, has risen again to become the third most popular poker site on the net. As soon as you enter the PartyPoker website, you'll probably be surprised by the minimalist look the site has adopted when compared to other sites which seem to be much more flashy. If, like me, you like the functional aspect of things, you'll be as pleased as I was. To get started, you'll see a "Free download" button on the screen - hit this to download a small .exe file. There does not seem to be a version for Mac, but you can play in your browser. Once downloaded, you just click on the .exe file to get things motoring. I tried it under Wine in Linux, but the installer wouldn't install, so I guess this is really Windows-only. There is a two-step process to registration. On the first screen you set your username and password. On the second you fill out your name and address, your date of birth and set up a security question. Most sites offer you a first deposit bonus when you join and PartyPoker is no different. As soon as I had registered a window popped up and a service representative offered me my bonus, which was 100 percent up to a limit of $50, with a minimum deposit value of $10. The bonus would be added to my account in ten parts, and in order to release each part I had to earn Reward Points equal to 0.8 times the bonus amount (so in the case of $50, I would have to earn $40 worth of Reward Points). Two Reward Points are awarded for every $1 in rake generated - so to release the whole $50 I would need to generate $200 of rake. The first thing you'll notice about the PartyPoker client is how different it looks when compared to other poker clients you're perhaps familiar with. Everything is presented in a simplistic style using the PartyPoker colors of orange and silver. It's really quite effective, and it's nice not to be bombarded with things you've no interest in. This is the default setting, but with one click you can easily switch over to a more typical view you'd associate with poker clients. It's notable how much effort has been put into the design of this client - most options are available with just a single click, and everything is really easy to set up just the way you want it. All the latest games were set as large square icons that flipped over whenever you hovered your mouse over them so you can fill in your bankroll when playing at a cash table, or the buy-in amount for SnGs or MTTs. If you flipped over to the more traditional view you could see the large amount of options that were available when it came to games, including FastForward, which is PartyPoker's version of speed poker. There were some 15,000 players online whilst I was choosing what to do. 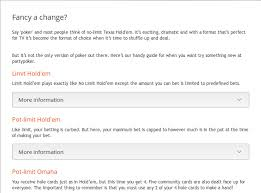 It's a very modern approach to a Poker Client, and a very good one at that. Heads-up through to Multi-tables. Buy-ins: $0.10 through to $5,000. In addition, you can play several different casino games via the client, including blackjack and roulette. You also had access to PartyPoker's sports-betting opportunities. As I wanted to try out PartyPoker before using any of my real cash, I quickly switched over to play money and see what I could find. I selected the SnG option, and was surprised by the lack of players and available tables. There were some 9 player and 10 player SnGs, but no 6 player, which is my preferred option. I selected a 10 player table, as that was the only table that had more than one player registered. It was very easy to register, and the table did fill up quite quickly. I was then sent through to the table. This was the only time I didn't find the miminal design of PartyPoker appealing. I do prefer the traditional view when it comes to my poker playing, and found I could only switch to the kind of view you more associate with poker playing if I quit the game, which of course I didn't want to do. This modern view did take some getting used to, but I managed it quite quickly. The controls were very good, although I would have appreciated "quick buttons" to determine placing bets based on the size of the blinds. Post flop I was delighted to see some easy options to make bets based on the size of the pot, which is something I find important and saves time when you're playing. The gameplay was smooth and quick, and the whole experience was excellent. There are probably other language options available, but I could not find any details on the site nor any option to change language setting within the client itself. PartyPoker has dedicated poker rooms for countries that have strict policies and guidelines for online gambling, such as France and Spain. USA players are not allowed to play real money games - although there is a special site for New Jersey players. As you would expect, PartyPoker has a number of regular promotions and rewards schemes. You earn Loyalty points by playing real money poker at a rate of two points per $1 of rake generated. There are four levels of VIP status - you start at Bronze, the if you average 400 points a month you move to Silver, then to Gold once you top 1,000. The next level up is also the highest - Palladium, which you attain if you can score 9,000 points or more in a quarter. The higher up the scale you move, the better life becomes for you at PokerStars. Once you achieve a new level, you can obtain a poker bonus up the maximum of $15,000 for 100,000 points at Palladium level. You can also exchange Loyalty points for items at the PartyPoker store. 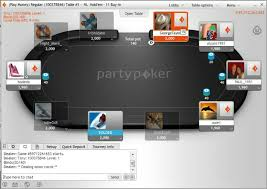 PartyPoker has dedicated mobile apps for both the Android and iOS platforms. 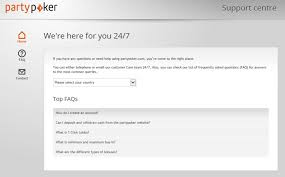 There is definitely an online chat function available for PartyPoker, but accessing it is a different matter. The chat window pops up upon your very first login to offer you your welcome bonus, but after that it is rather difficult to access it again. You can use the chat function that's supposed to be available via the web-page, but despite being told I was at position 1 in the queue, and that my estimated wating time was 0 minute(s) and 0 seconds, no one responsed to me at all - and I kept the window open a good fifteen minutes. There are a number of FAQs on the web-site, so you'll just have to be content with that. Just make sure you ask any important questions on your first log in! ✔ - Nice, clean and functional "look and feel"
People coming back to the new version of PartyPoker who played at the old version are in for something of a shock. This updated version of PartyPoker has a very unique and modern look and feel compared to the old version, which was very much dedicated to the non-serious player, and fun money players, whilst having some great options for the more dedicated player. 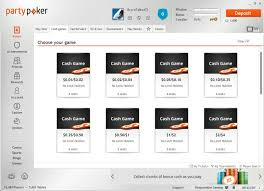 The modern realization of PartyPoker is vastly different, with its minimalist and functional design. New players may be slightly put off by this - which is a real shame as PartyPoker still has plenty to offer the complete newbie. If, however, you're like me - a semi-serious Hold'em player - then you couldn't be happier. Every is really easy to navigate and once you've gotten used to where everything is, life at PartyPoker is a definite breeze - especially the way you can largely set things up just how you like them. The only criticism I have of PartyPoker is the lack of help and support. If they could just go out of their way to be a little more helpful, then PartyPoker could soon be regaining that coveted number one slot in the world of online poker.